USS California (Armored Cruiser No. 6), 1907-1918. 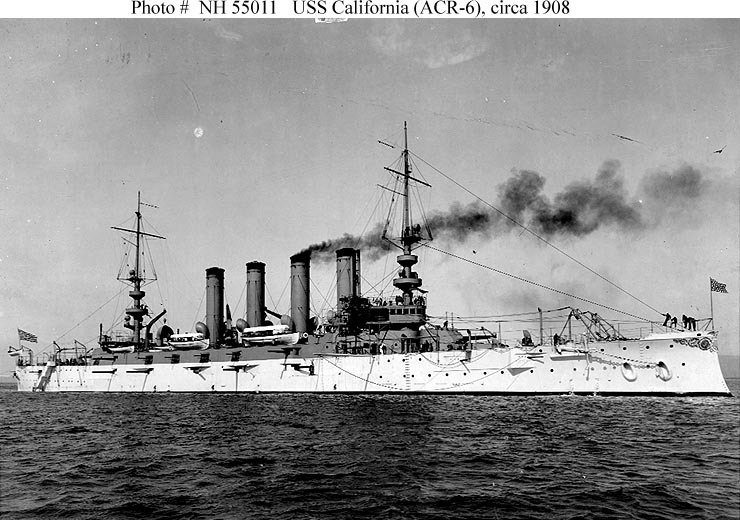 USS California, a 13,680-ton Pennsylvania class armored cruiser, was built at San Francisco, California. 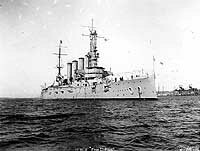 She was commissioned in August 1907, and spent the next ten years serving in the Pacific. California regularly operated along the North American west coast, with occasional cruises to Hawaii and other oceanic islands. In 1912, she briefly deployed to the western Pacific for service on the Asiatic Station. 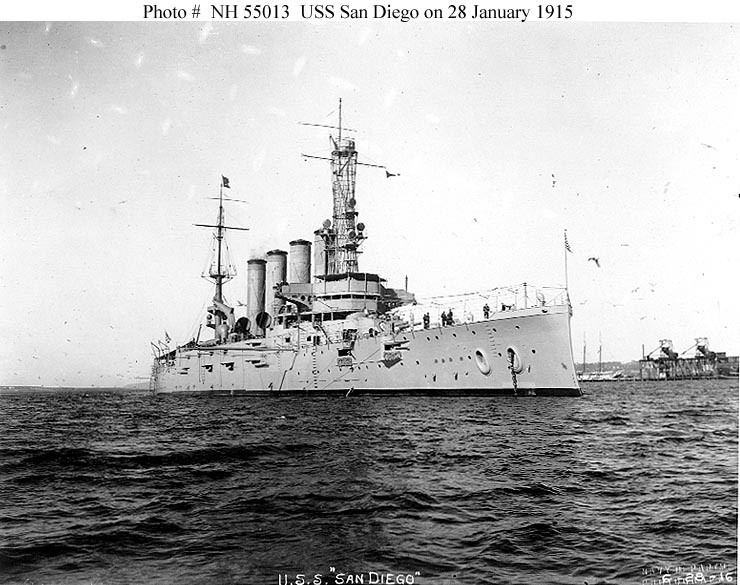 This page features selected views of USS California, which was renamed San Diego in 1914. For pictorial coverage of USS San Diego's last commanding officer, see: Vice Admiral Harley H. Christy, USN. 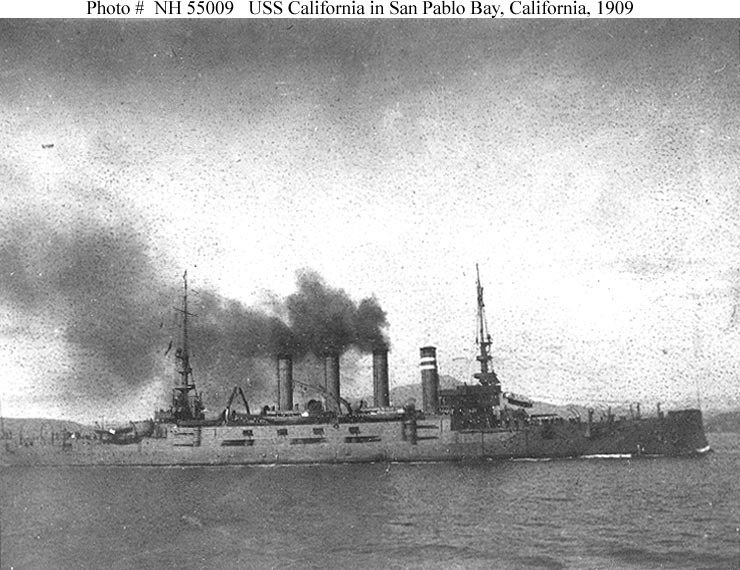 Underway in San Pablo Bay, California, 1909. Collection of Rear Admiral Ammen Farenholt, USN(MC). In San Diego harbor, California, circa 1910-1914. Photographed by the Arcade View Company. Courtesy of Captain Don Fink, 1983. Photographed 28 January 1915, while serving as flagship of the Pacific Fleet. 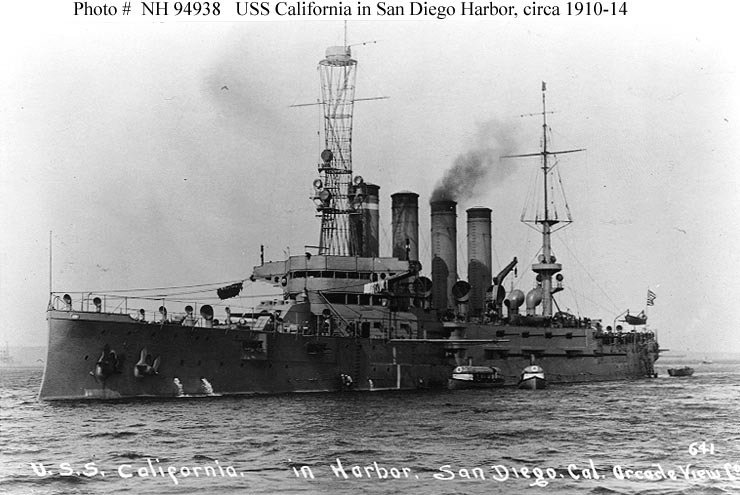 Her name had been changed from California on 1 September 1914. Note two-star Rear Admiral's flag flying from her mainmast top. 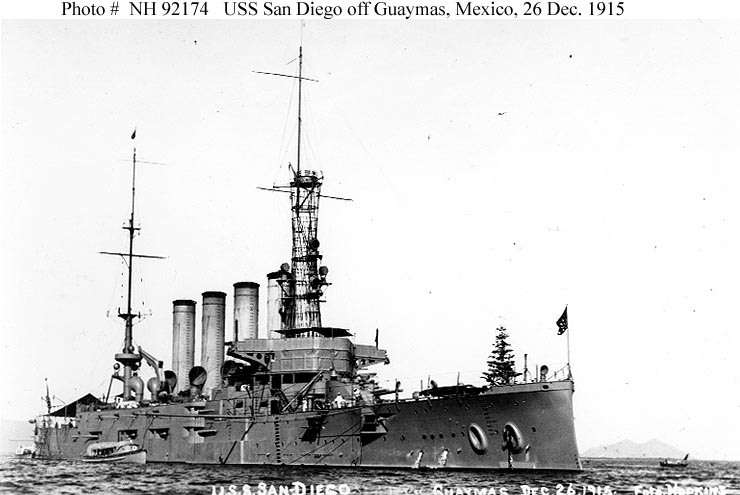 Off Guaymas, Mexico, 26 December 1915. Note Christmas tree mounted on her forecastle. Collection of Thomas P. Naughton, 1973. Painting by Francis Muller, 1920. 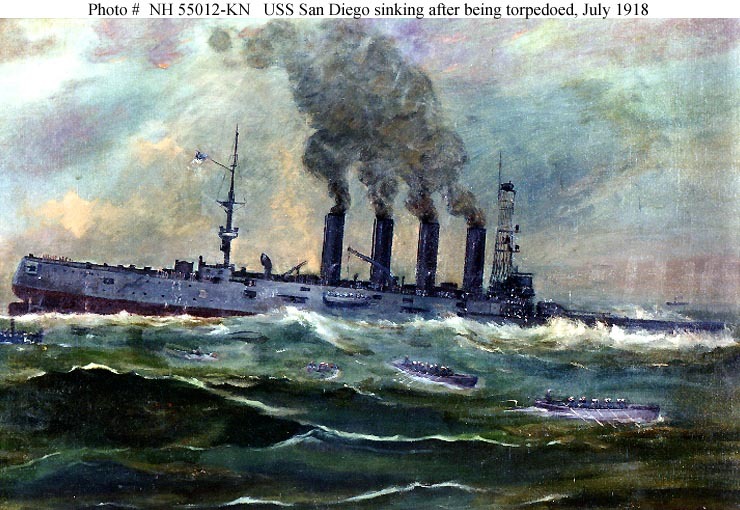 It depicts the ship sinking off Fire Island, New York, after she was torpedoed by the German submarine U-156, 19 July 1918. Courtesy of the Navy Art Collection, Washington, D.C. 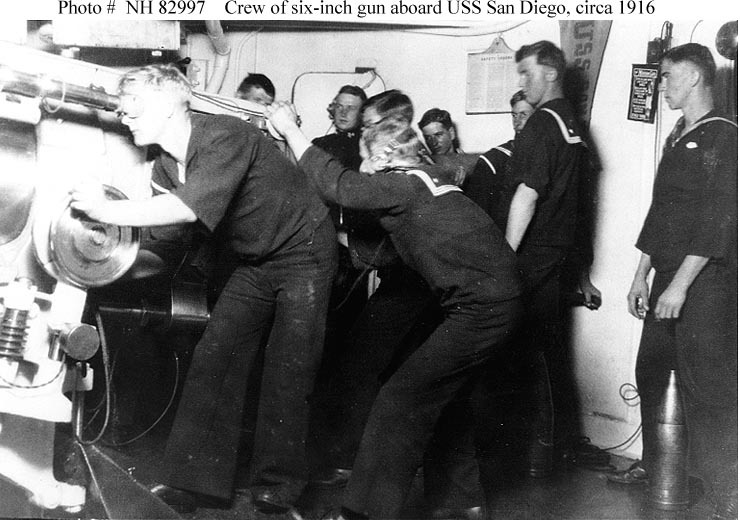 Crew exercising one of the ship's 6"/50 broadside guns, circa 1916. Note: gunsight in use; items posted on the bulkhead in the upper right, including safety orders, pennant bearing the ship's name, and "Modern Girl" poem. 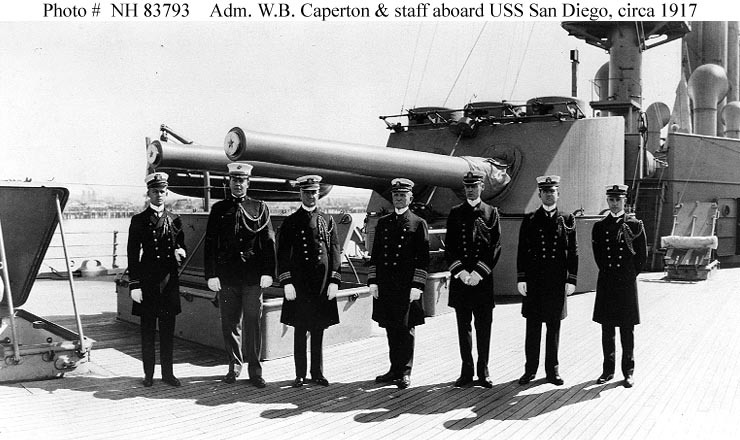 With members of his staff on board USS San Diego (Armored Cruiser No. 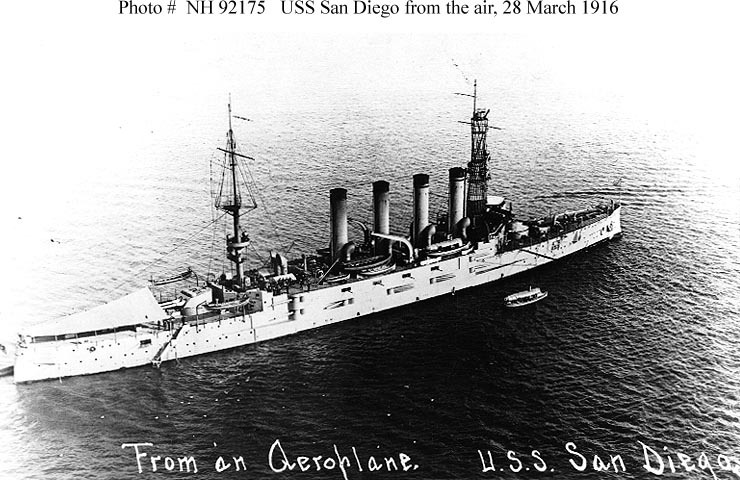 6) at San Diego, California, circa 1916-17. The ship's after eight-inch gun turret is behind them. Courtesy of the Naval Historical Foundation. Collection of Adm. W.B. Caperton.